(NewsUSA) - Colorectal cancer deaths are slowly declining, but shocking racial and ethnic disparities remain. According to the American Cancer Society, Latinos living in the United States are more likely to develop and die from this disease than those in many Central and South American countries. African-Americans are at least 41 percent more likely to die from colorectal cancer than whites. Both groups are also less likely to get screened, and their cancers are often found later. A growing number of medical groups, patient advocates and members of Congress say virtual colonoscopy - known medically as CT colonography - can overcome cultural stigmas and anxiety associated with this screening. "CT colonography can attract those who would otherwise not be screened, allow doctors to remove more polyps before they become cancers and help people avoid getting this disease," says Carolyn R. ("Bo") Aldigé, president and founder of the Prevent Cancer Foundation. Virtual colonoscopy is an American Cancer Society-recommended screening exam. Studies show that it is as accurate as standard colonoscopy in most people - including those 65 and older. Virtual colonoscopy increases screening rates where it is offered in the U.S. and abroad. Former President Obama chose to have the virtual exam. Michael Sapienza, President and CEO of the Colon Cancer Alliance, says the virtual exam can "jump-start screening by offering access to a less-invasive option that millions of screening age who choose not to be tested find more appealing." However, the virtual exam is far less invasive than standard colonoscopy. 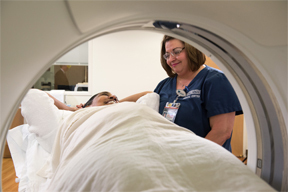 The CT scanner uses low-dose X-rays to make 3-D, moving images of the colon that doctors examine for polyps and cancer. The test does not require sedation. It is over in minutes. And you may not need someone to drive you to the exam. Afterward, you can go back to daily activities. Thirty-six states require that insurance policies sold in their state cover virtual colonoscopy. Insurers who take part in federal exchanges are required under the Affordable Care Act to cover the exam. CIGNA, UnitedHealthcare, Anthem Blue Cross Blue Shield, Aetna and other insurers cover these tests irrespective of ACA requirements. Screening those on Medicare with virtual colonoscopy may cost nearly a third less than standard colonoscopy. Yet, Medicare is among a shrinking number of insurers that does not cover the test. "We need more Medicare-covered options, including CT colonography, to increase Hispanic screening rates and save lives," says Elena V. Rios, MD, MSPH, president and chief executive officer of the National Hispanic Medical Association. Patient and provider groups want Congress to pass a new bill that would provide Medicare coverage for virtual colonoscopy. "With Medicare coverage, CT colonography can increase screening and reduce unnecessary deaths," says Judy Yee, MD, chair of the American College of Radiology Colon Cancer Committee. Find more information on virtual colonoscopy (CT colonography) at RadiologyInfo.org/virtualct.